anagram and multi: Are you game? I’ve got a second word tool today — in fact, two tools from the same package. I discovered both of them purely by chance, while picking through an apparently unrelated list of software. Here’s anagram and multi. These two wunderkinder are hiding inside the yawl package (don’t ask how I got there; I don’t remember), which is advertised more as a word list than anything. The makefile in that package will allow you to build both anagram and multi, and on my Arch system neither needed any coaxing. multi, on the other hand, finds combinations of legitimate words that use all the letters in the sequence or word you provide. In other words, you’ll use all the letters to make several words at once. As a warning, multi has the potential to really bog down your system, if you give it a long word and ask for a lot of combinations, for example. 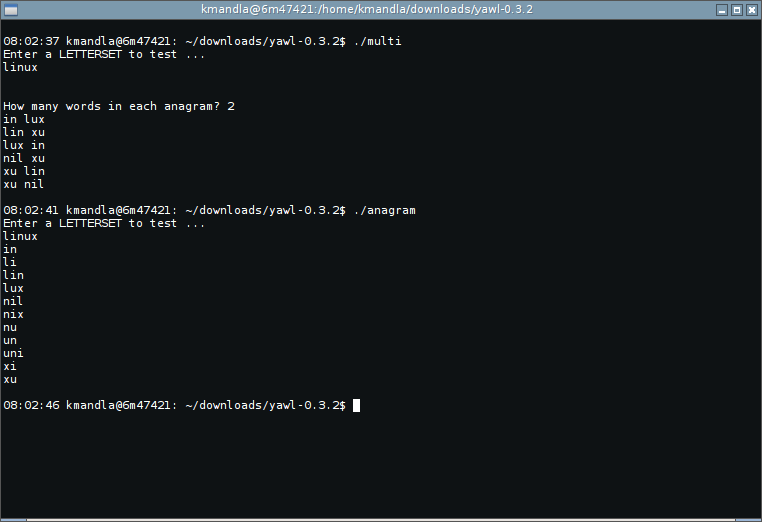 As best I can tell, neither anagram nor multi — nor yawl, for that matter — is in Debian or Arch. So I give you something new today. This entry was posted in Linux and tagged game, generator, word on 2015/03/09 by K.Mandla.